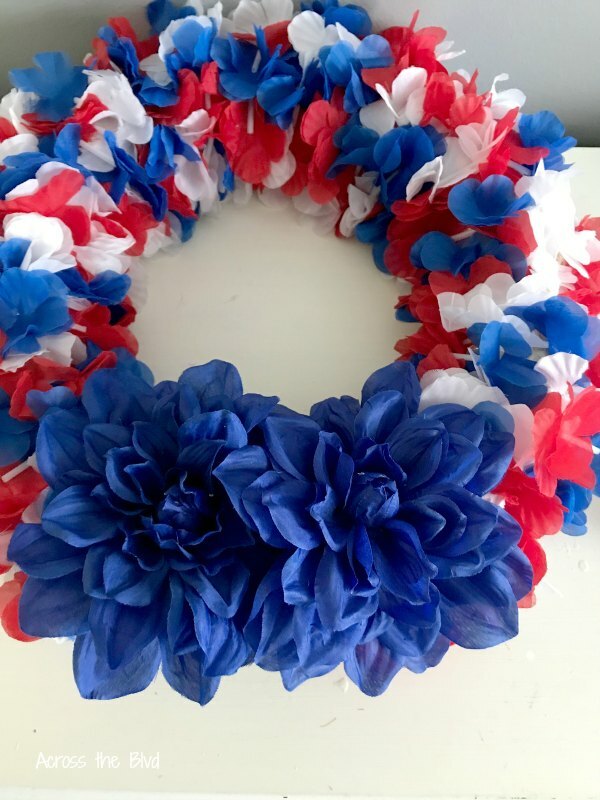 Making a patriotic wreath using dollar store items is something that I’ve done in previous years. This year, I found leis that I thought would be perfect for wreath. 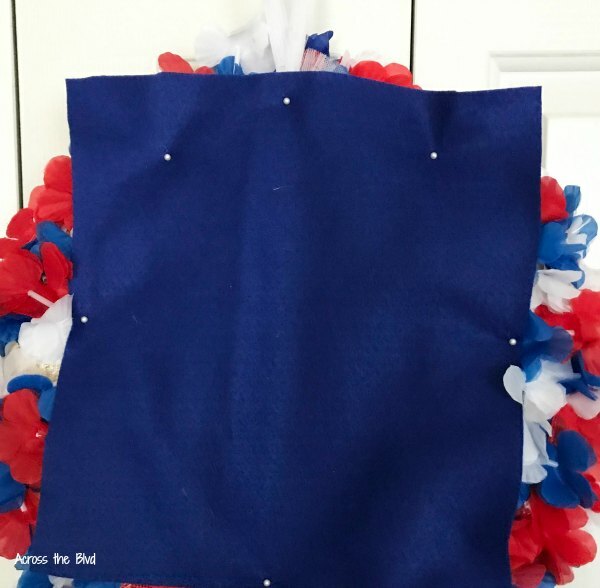 Adding a few other embellishments made this a festive wreath to show off some red, white, and blue! Each month, we join a group of our blogging friends for a challenge. 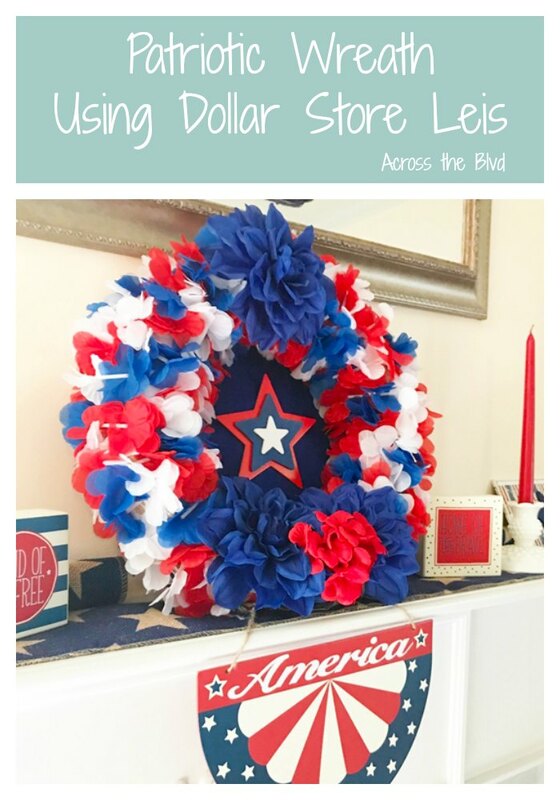 This month it’s a dollar store craft challenge. We’re joining a group of talented bloggers this month! I love finding items at the Dollar Tree that I can use for crafts. I always find some great seasonal items there. 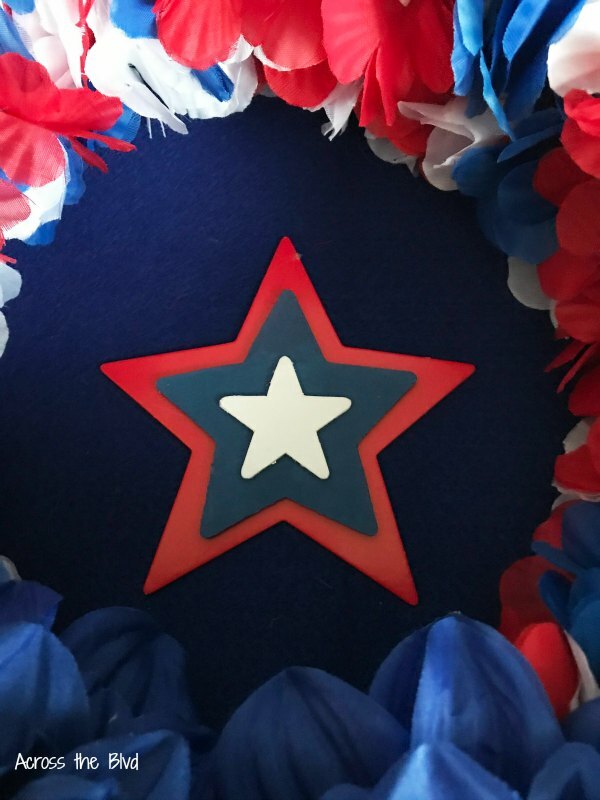 Last year, I made a Patriotic Wreath using mini hats from the Dollar Tree. 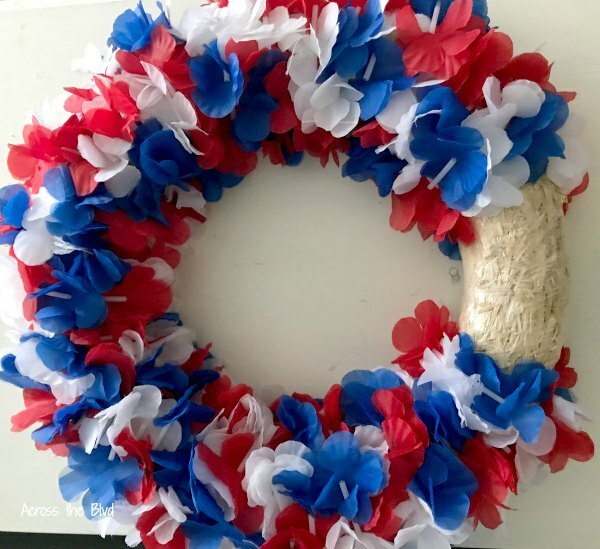 When I spotted the red, white, and blue leis this year, I knew they would be great for a wreath. 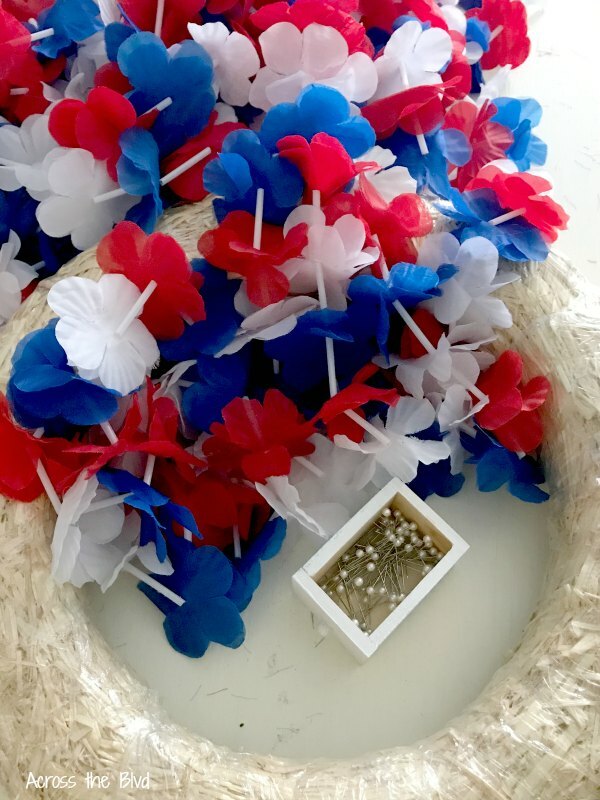 Dollar Tree Leis – They come 3 to a pack. I bought 3 packs. 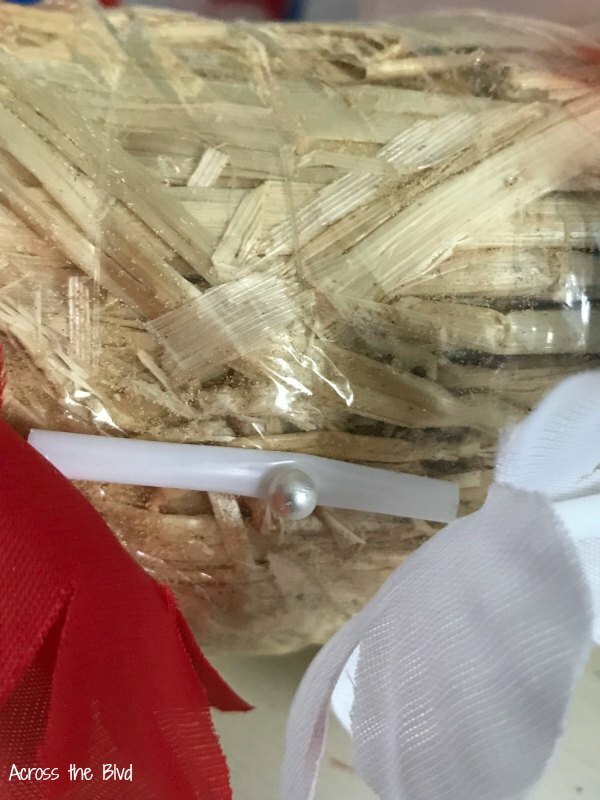 The flowers on the leis are attached using a plastic tube. It was easy to attach them to the straw wreath form using pearl head pins. I added pins as I wrapped the leis around the wreath form, making sure keep them bunched together for a full look. As it turned out, I should have purchased one more pack of leis. Rather than making a trip back to the store to get another pack of them, I improvised. I added a couple of strips of wide ribbon around the blank spot and then covered that with two large silk blooms from my craft stash. The flowers are also pinned in place. I wanted to add stars to the center of the wreath, and I wanted to make sure they would stand out. To get the look I was going for, I added a piece of blue felt to the back side of the wreath. Using acrylic craft paint, I painted three different size stars in red, white, and blue and glued them to each other and then to the felt. I added a red flower to the bottom and another blue one at the top. It didn’t seem to be balanced well with only the flowers at the bottom. I’m using this as the focal point of our patriotic mantel decor. I’ll be sharing the rest of the mantel decor soon. Sign up below to receive our posts and newsletters via emails! 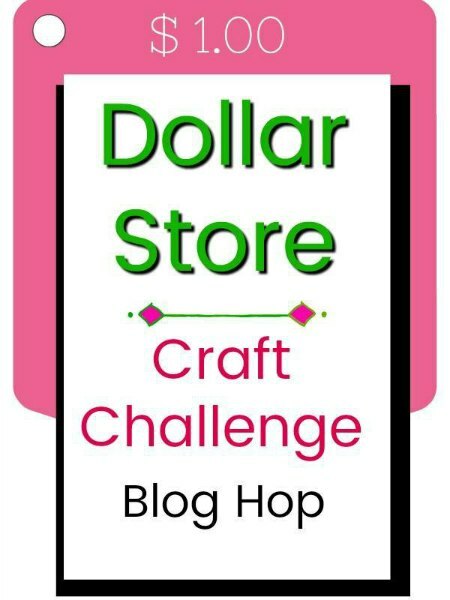 I hope you’ll stop by to see how all of this month’s participants met the Dollar Store Craft Challenge. fabulous way to get the party started. Thanks, Michelle. I always look forward to the dollar store craft challenges. Another lovely Dollar Store craft, Beverly! Very pretty and patriotic! You can’t beat the dollar store for inexpensive items to craft with. Thanks, Gail! 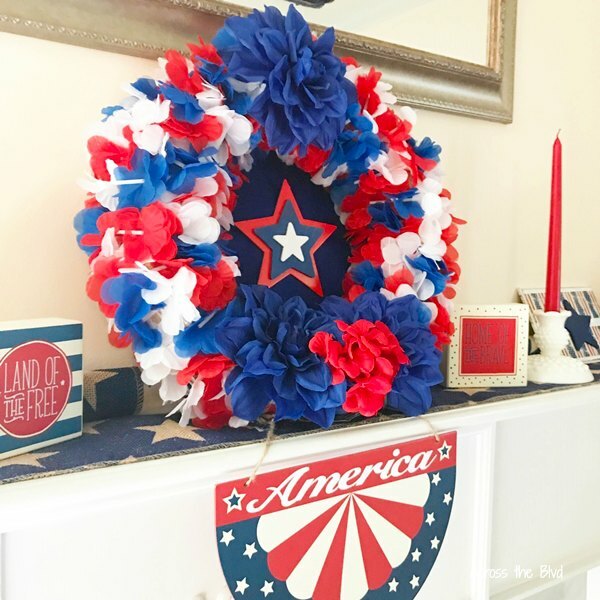 A beautiful Patriotic wreath with vibrant colors! Love how easy it is to make! Thank you, Shirley! I was happy to have found those leis to use for the wreath. I always love sharing simple projects like this one. Such a great idea! I never thought about using leis to create a floral wreath! It looks great, and I love the red, white, and blue! I hadn’t thought of it either until I spotted the leis at the dollar tree. Thanks, T’onna! This wreath is adorable! I loVe the idea of Using the Leis. I was actually undecided at the dollar store & was trying to decide between the leis & pinwheels. Thanks, Jenny! The leis were super easy to use for a wreath. I looked at the pinwheels, too. It’s always fun to find crafting items at the dollar store. Sometimes, improvising is better than another trip to the store! Thanks, Marci! The leis make a pretty festive wreath! The silk flowers was a great idea to cover the gap. I like the stars that you added to the center, very clever and does make the wreath a great focal point on your mantel. Pinning! Thank you, Laurie! I was determined to find a way to cover the gap without going back for more leis. The flowers worked pretty well. I’m enjoying how it looks on our mantel. Thanks for pinning! What a fun way to make a wreath! I love the addition of the large silk flowers! Thanks, Roseann. I like the large flowers, too. I love how full the wreath is and that you were able to improvise and make such a beautiful wreath. Pinned. Thank you, Joanne! I was pleased that I found a way to make it work. Thanks for pinning! I love your patriotic mantel. Your wreath is a stunning focal point. These blog challenges make me think outside the box, and it’s so fun to see what everyone creates! Thanks, Kristin! I love the blog challenges, too. They are always fun and I love seeing what everyone in the group creates, too. Love this wreath. 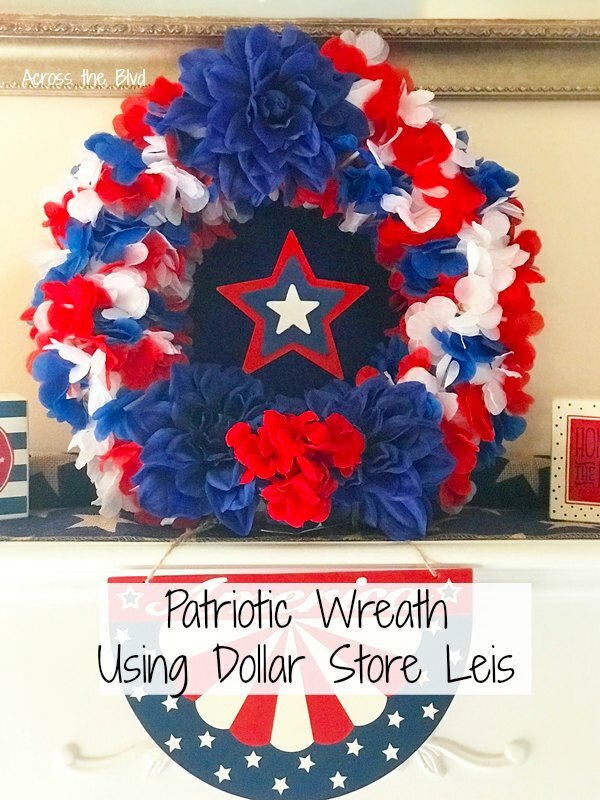 What a great idea to use dollar store leis. Who would have thought? You are my feature pick at Wonderful Wednesday Blog Hop this week. Thanks so much, Bev! I appreciate the party and the feature. Hope you’re having a great week, too! What a creative idea!! And you can’t beat a dollar store project! Thanks for sharing at Merry Monday – I’ll be featuring your wreath this week! Thanks, Emily! I love dollar store items for crafting. Thanks so much for the feature! Thanks so much, Michelle! I appreciate the feature! Hope you have a wonderful week. I love how you added the felt to the back of the wreath to create a center backdrop. Will try that on my next wreath 🙂 Pinned. I’ve done that a few times for wreaths and I always like the look. Thanks for pinning!